Just finished watching this great movie. 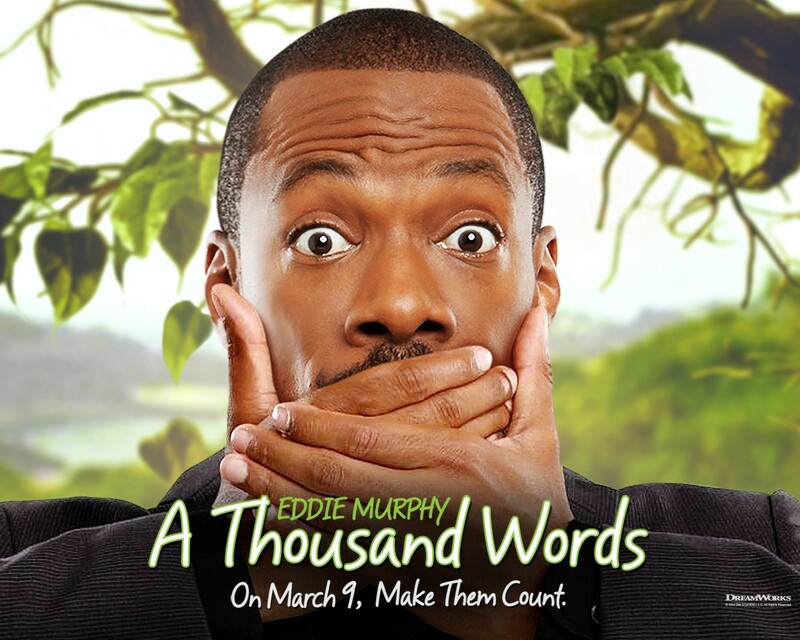 The movie A Thousand Words tells the story of Jack McCall (played by Eddie Murphy), a man who talks too much and cheats and lies his way to the top. He is consumed with making money and getting only what he wants out of life. He hears about a guru who’s fame seems to be rising, and all he can see are dollar signs. So he meets with this guru, offers him a book deal, and thinks he’s gonna get rich. The opposite is true. He ends up with a mysterious tree planted in his yard, that seems to be strangely linked to himself. Whatever happens to the tree, happens to him. But something even stranger than this occurs – for every word he uses, the tree loses a leaf. As the leaves begin to drop and he realizes they are dropping for every word he speaks or writes, he begins to try everything he can to get rid of this tree. In some comedic moments we watch as he tries not to waste his words – a hard thing to do when you are used to talking and lying your way through life. As the tree’s leaves fall with every word he says, he feels himself losing energy and like he is losing his life force. He then realizes that if all the leaves on the tree fall, he most likely will die. He attempts to stop the falling of the leaves by trying out religion, donating to charities, or doing random acts of kindness. But to no avail – leaves just keep dropping every time he speaks. Due to people thinking he’s crazy, he ends up losing his job, his wife leaves him, and he has no friends, except a random coffee barista and his lowly assistant from work. He has nothing left except himself and the tree…and silence. As he gets down to his last few leaves, he realizes he needs to do some soul-searching. So in the forced silence of his circumstances, he begins to look at his own life and at his own soul. He visits himself as a child in his memory, listening to his own pain and taking the time to see himself in that pain. As the leaves get even fewer, he takes a walk on the beach and for the first time in years sees and hears the beauty of life around him – the miracle of the NOW. He looks at his life and all the things that are beautiful – his child, his wife, his health. With only a few leaves left, he finally sets out on a journey to use those last words wisely. He visits his wife and child, his ailing mother, and finally his father’s grave. With every last leaf he uses words that make a lasting difference – words that are not wasted. That’s as much as I will say – you’ll have to see the movie for yourself to find out how it ends! When was the last time you were silent? When was the last time you listened – really listened – by holding the space for yourself, or for someone else? When was the last time you picked your words carefully – not wanting to waste a single word – because life was just that precious? When was the last time you stopped and really noticed life around you? Not planning ahead to the future, or analyzing the mistakes of the past. Not checking Facebook or your phone texts. Not turning on the radio to drawn out your own mind – but just made yourself present to the moment at hand? When was the last time you opened your eyes and ears to the messages of the Sacred that are falling all around us every minute of every day if we just take a moment and BE STILL. A few weeks ago I spent some time in the mountains of Oregon. It was a retreat of sorts, where the mornings were silent and we had time to listen – really listen – to our souls. The place was a place of safety. The others there were kindred spirits on a similar journey – a journey of longing for solitude, and wanting to slow down in this rat race we’ve created – this race we’ve almost convinced ourselves is true happiness. That week was and still is amazing. I’m still processing it – perhaps soon I will write about some of it here. But one thing is certain, now that I am back in the “real world.” This world we’ve created – this consumeristic living and comparing and surviving and mistrusting and this every-man’s-an-island mentality – this is not reality. This is not the way it was or is supposed to be. With coming back and these two realities colliding, this is what I see: The more simple, the better. The more broken and vulnerable, the healing can begin. The more silent, the more truth and beauty is spoken. There are things that we all have within our grasp – things that money could never buy. But these things require a payment of sorts. They require time – they require a willing risk to say no to the games of politics and religion and social classes. These things require us to stop and listen and BE STILL. (I will write more of this and some of my experiences in some future posts). May we realize that the very things our souls ache for are perhaps already in our hands. In fact, the more we try to attain “stuff”, the more we lose the real stuff of life: joy, peace, love and the Sacred. Hush. Be still. Turn down the noise. Put your money away. Pause. Do you hear it? That’s the Sacred whispering your name. And the questions you are running from and the peace you’re trying to buy? Just stop for a minute and let the questions be heard. And the peace? The peace – it will come. Intense stuff here! Thank you, this is what I needed right now. Money can buy an education, but not wisdom. Money can buy a “makeover,” but not inner beauty.